Golden “In HIm” Meeting, with Elements! The Government Shall be on His Shoulder. The following may seem foolish to the carnal mind, but in the spirit realm it is real. The spirit realm affects the physical and the physical affects the spirit realm. Faith without an act is dead and by faith we are headed into a meeting with the Lord that occurs in the fourth dimension, in His Kingdom. As you read on you will find that the Lord gave evidence of this. After everyone has gathered and has taken off their shoes, we sit for a little while listening to the Lord for any special instruction. He may give a song phrase for us to sing or some other instruction. Then we circle up standing (not touching each other) and share in a quiet voice anything the Lord revealed to do. If He has given a song phrase, the person who received the instruction starts singing it and everyone joins in. Sing the phrase, but no more unless the Lord reveals to do so. Don’t get into your own spirit and bring something more than the Lord wanted. Sometimes the Lord tells us to sound the shofar. Sometimes the Lord indicates for us to be totally silent, even through the washing. It’s all about listening to Him and obeying. Then we thank the Lord for His Laver, which is invisible (like a child's make believe) on the floor in the middle of the circle. While we are thanking the Lord for His Laver and sometimes adding in something He has done, we begin to make movements (actions) of symbolically washing ourselves with His Laver water and the Blood of the Lord. (I have had a few people demonstrate bending over and washing.) The Lord did tell us to wash between our fingers, as well as everything except our back because we can’t wash our back with our own hands. Then we all turn to the right and wash the back of the person next to us with invisible water/Blood from the Lord’s Laver. It’s all symbolic, but it’s real in the spirit realm. It doesn't take very long; no need to hurry. I AM revealing things unknown to My Beloved. Purity, Holiness. Most have no concept of purity. Purity of thought, purity of deed, purity of action, purity of motive. Purity in all. Words spoken contain these, think on this. I hear your thoughts, think on this. I see truth of motive, think on this. I AM purifying My Beloved. Power unknown to the world is reserved for My Beloved. She must be pure clean, Holy. Set apart to Me, Jesus. I AM revealing areas that need purification. Walk in all purity. Do not be discouraged, be encouraged. One must first see their true condition to see their true need. I Love in pure truth. The truth, My truth, will set captives free. I Love you. This gives a glimpse of the importance of cleaning ourselves right before we enter into a meeting with the Lord in His Kingdom. This Laver process is also done before a Judgements Meeting. We are now finished at the Lord’s Laver and total silence is key to starting to enter into Him in the next step. Moving from the Laver single file into the Holy Place (No 3) we circle up again, not touching each other. We stand silent for a short while. As a reminder, the Lord said silence is necessary because He is Holy. The Holy Place is a place of silence where we are entering in and hopefully everyone is realizing the importance of something that is about to happen. Then we bring the loose circle in tight as shown in the picture. You don’t hold the person next to you with your hands, only holding both person’s arms who are one person away from you as pictured. Circling up tight is necessary as an act to establish the corporate body becoming one person. The Lord said two become one in a marriage, and we need to understand that one person, that being the corporate body as one person, enters into the Lord. One person entered into the Lord in the Holy of Holies in the temple. Here is a very important element to understand. After the group has circled up and established being one person with that act, the group must produce silence as that one person. This takes some time. What is happening? Many times the Lord has been seen by different people with His arms around the group loving on us. Years ago when the Lord first started dealing with me about meetings, I had asked the Lord what was so important about meetings? He said, “I haven’t had a woman I can love on!” That was what the Lord was doing when He was seen with His arms around everyone in our circle. The Lord may do this every time we circle up forming one person in the fourth dimension even though we may not see Him! Next is an important action by the group after it symbolically becomes one person. After the silence is created by the group as one person, it must be offered up to the Lord. 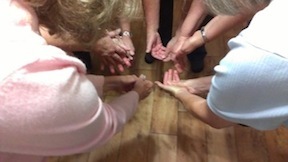 We developed an act of turning our hands upward as a group so we were all doing it at the same time. Our watchman simply turns her hands up, offering the silence. This action moves around the circle in silence because we all know what is happening, therefore we are in unity in offering up the silence. We have had the Lord thank us for offering up the silence produced. This offering of silence relates to the “Altar of Incense” that the Priest had to pass by to enter into the Holy of Holies. If you have read the other materials on Golden Meetings and the Holy of Holies, you know the incense is the silence. That is why, after silence is created as one person, it must be offered up with an act before going into the Holy of Holies, which is into the Lord - just as it happened in the Old Testament. Also, don’t forget, silence is warfare as revealed in previous writings. 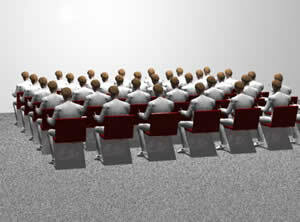 When we walk into the area where we hold, “In Him” meetings, the chairs are set in rows as seen in this picture. We do military type actions because God is a God of order and we are “one person” entering the Throne room with the Holy of Holies atmosphere. We are entering into Jesus just as the priest did in the temple. We move by the chairs single file and wait, standing until everyone is in front of their chairs and the person who is our watchman has taken their place before the Lord as pictured to the left. 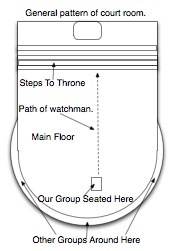 You will not have this watchman position filled unless the Lord establishes a person to do this in your group. Instead, you will all be carrying pencil and paper to record anything the Lord gives you as you sit before HIm. The temple atmosphere in the Holy of Holies was silence. It had walls, but now the Lord has revealed we can develop the same atmosphere without walls and meet in Him as one person, just as the priest did. It’s a temple without walls, a throne room without walls. As indicated in the meetings book, the Lord talked about crossing over into the Kingdom of God in the spirit realm and that it took effort. The Lord depicted the difficulty of crossing over as having to climb a rope as depicted in this picture. Notice that the first effort the man had to undertake was climbing up the rope to the grey bridge so he could cross over; after that it was an easy walk. We have learned what that effort entails concerning the Lord’s boundaries. Here I give witness to what the Lord revealed in one of our meetings that the Lord really wants people to understand. I saw the watchman and the table where she was standing before the Throne, although the Throne was not clear to me. I saw action for a moment and the following scene manifested around the watchman and the table. There was a person (a being) in front of the watchman to her right, and a person (a being) to her left whom I could not see fully from my position because of the watchman. Both people (beings wearing robes) were slightly bent over the table doing Kingdom business and there was no pomp and circumstance, it was majestic. The one person (being) on the right had a staff with gold on it, a narrow strip of brown & then gold again. 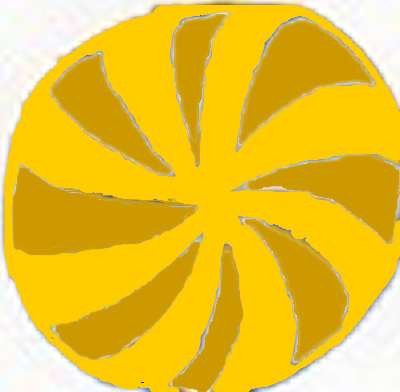 There was a circle on top of the staff with a design, something like I have depicted. The alternating colors were gold and brown. It was all military, authoritative, and very orderly. The person (being) on the right with the staff had a position (he had a purpose in that courtroom, in looking at the Words that the watchman was getting from the Lord). I was stunned at what I saw and knew that God wanted us to know, without a doubt, that we were meeting in the Kingdom of God, having crossed over into the fourth dimension as the Lord long ago revealed we should. I realized we can do this every time when boundaries and elements are adhered to correctly. I remembered how the Lord had told me that once He has revealed something to me He did not want to have to reveal it again. He shouldn’t need to. Remember, when doing a Golden Meeting we are not to ask questions with our mind. We are to enter without an agenda. We are to listen and record - do not interpret anything, just record for the “after meeting”. We leave the room orderly as we entered and go to the room where we have our “after meeting” to hear what the Lord said. We remain standing until all have entered and sit down together to go over the Lord’s words. Remember, this meeting is also orderly, and you should keep on the subject the Lord brought forth. You should be listening as the Lord may have you do something in this room also. Meet with Me more. Why do you have trouble with this? Am I not most important? Do I not provide everything? It is important, would I ask of you if it wasn’t? This is the time to draw near to Me, to become one with Me. This is not possible without Golden meetings. How will you know My will for you? How will you learn My plan? The times are changing, you will need to be close to Me. You will need to follow My command. How will this be possible if you don’t meet with Me? Meeting over.